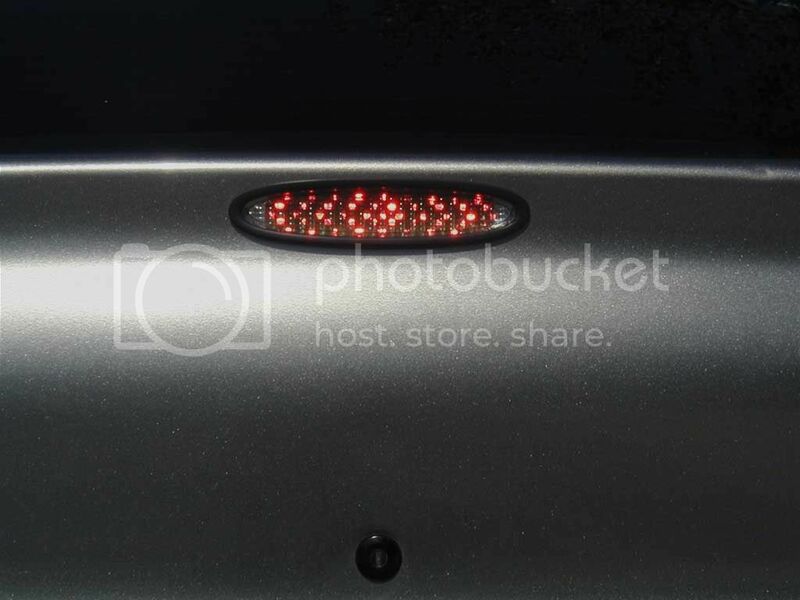 On this page you will find instructions on how to install Nitehawks LED board into your third brakelight. This board is not a direct fit because it was designed for second gen housings but we found a way to make it work with all the LED's showing. NOTE: THIS IS FOR FIRST GENERATION NEONS ONLY ('95 - '99); '00+ WILL WORK WITHOUT MODIFICATION. OK, let's get started. 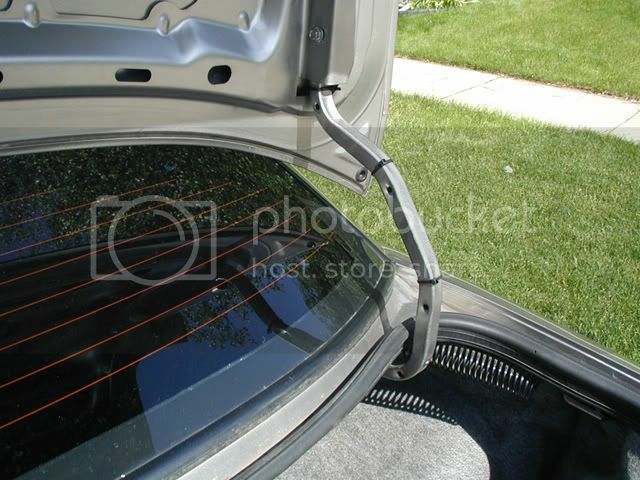 This is assuming you already have the housing off the car and the LED board in your posession. Use the hacksaw to cut a "slot" on either side with the bottom being flush against the flange or surround. Sorry for lack of details in the pictures. These were taken a while after I actually did it. Size it up with the board leaving enough room to slide the LED's in. Once this is done, use the dremel to soften up the edges a bit (optional, but recommended). You can see how my cuts lined up in these two pictures. Use a dremel to cut notches out on the edge of either side so you can fit the last LED. If you don't do this, two LED's will NOT show at the far left and right. This may require a few test fits. We were lucky enough to get it right the first time. Now that you have all the cuts done, slide the board through running the wires out the hole that held the old bulb in place. Use the silicone and two clamps to hold the board in place and let cure, I also used it for waterproofing so the board wouldn't get wet. I let mine sit overnight to make sure the silicone had set. Make sure the silicone has set and the board is not moving. 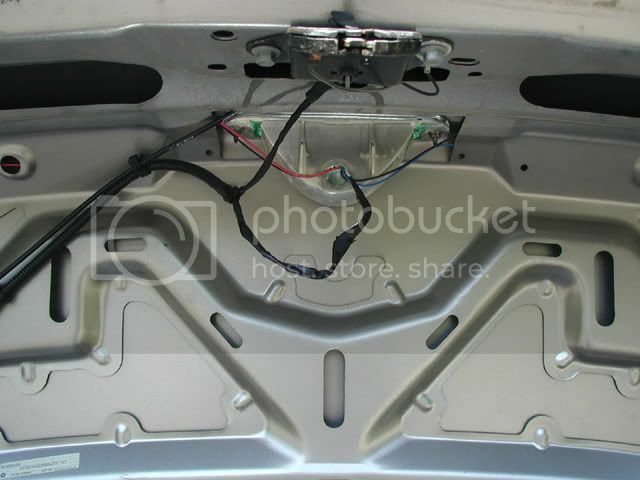 Go ahead and put the housing into the trunklid with the wires all hanging down. Seperate the wires out. Here are the color codes. 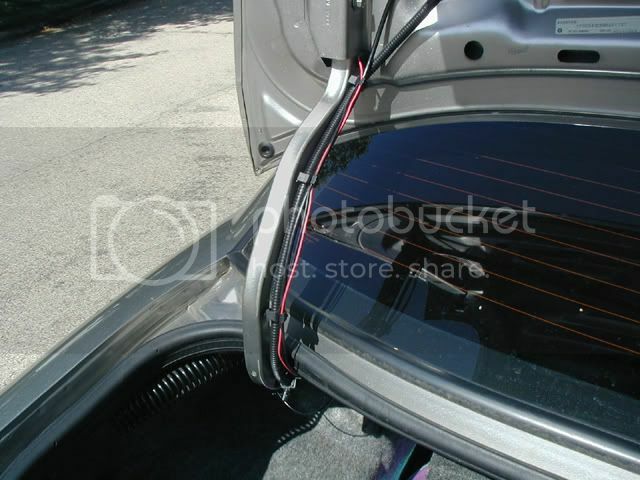 Now slide the Red and Black wires through the left side support bracing in the trunk (easy to do) and zip tie the wires as you see fit to hide them. Slide the Blue and Black wires through the right side and complete as you did to the left. The picture below that shows you how to use the red splice that is included in the kit. 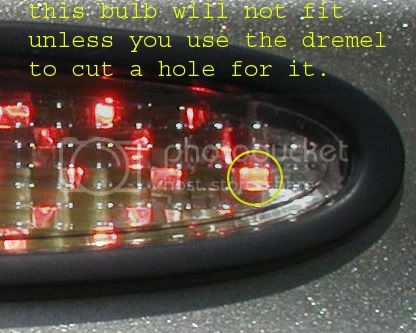 Pull back the carpeting that covers the tail-lights (if you car has this) and pull the socket out of the housing for the brake/turn bulb. Splice the corresponding wires together on either side. Push the carpeting back in place and hide the leftover lengths of wire somewhere back there. 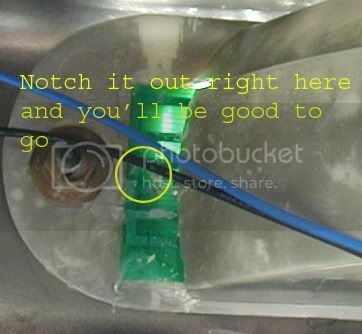 Cut the old bulb wiring and expose a bit of it so you can connect the corresponding wires to it. Done? Connect them. 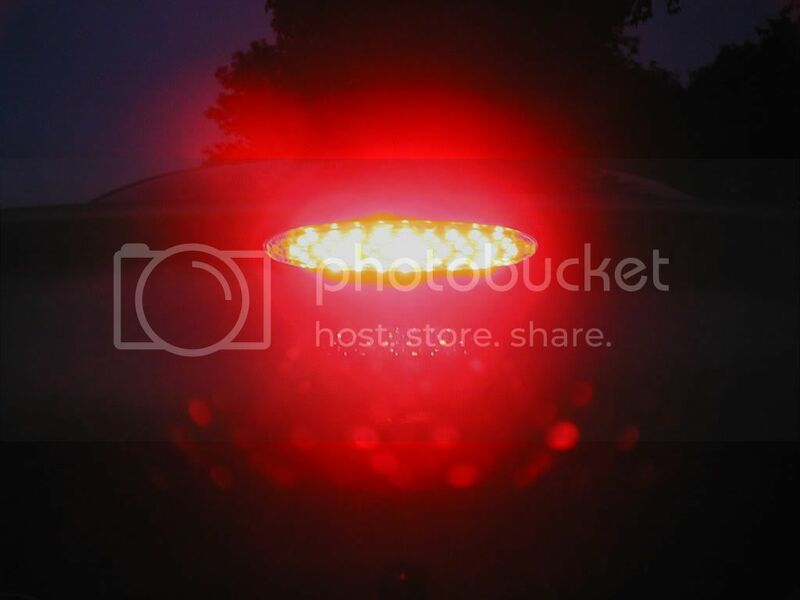 Put everything back in place and enjoy your new LED brakelight!